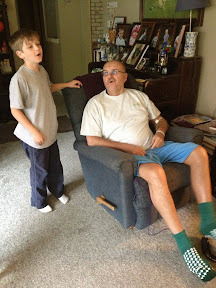 For those that don't know my dad-in-law had a stroke. Back in March he left for a class in Detroit planning to spend one night away from home and ended up being gone for 52 nights. He had a very severe stroke with a blood clot that caused serious damage to his brain. The damage was causing his brain to swell so they removed part of his skull to prevent further damage. 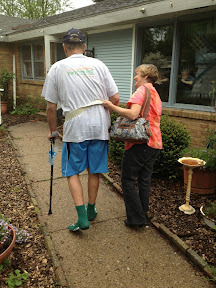 He's been in four different facilities and numerous doctors, nurses, and therapists have cared for him along the way. He has made unexpected progress and has amazed the health care professionals around him. He was so happy to finally return home on Friday. Anyone that knows him well knows that home is where he is happiest. It was awesome to witness. 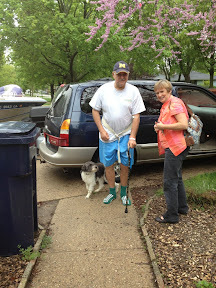 Lanny's recovery has been nothing short of a miracle and we are so happy to see more progress every day. But what has been even more incredible for me to watch is the outpouring of love and support from family, friends, co-workers, players, churches and the schools Lanny has coached for. Some of these people have come together to totally renovate Lanny and Carol's bathroom. They totally gutted it and are making it more open and easily accessible. This is him seeing it for the first time. What has also been awesome is to see how God is using this to impact people's lives. We have witnessed God moving and I am sure there is many things He has done that we haven't seen. 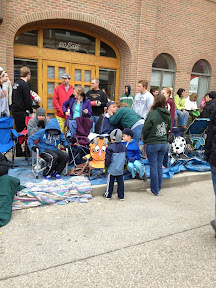 We had a fun weekend with friends and family around us. 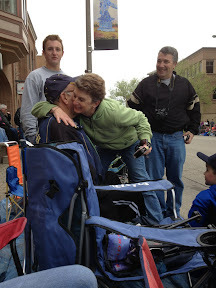 Lanny was even able to go to the Tulip Time Parade, which is an annual tradition around here. Thank you for all of your prayers and support. 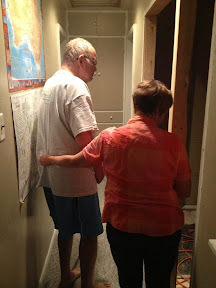 Keep them coming as Lanny and Carol continue to travel down the road to recovery.